RYS-Team KISKA Duo Jonathan Cecotto/Lennart Marioneck takes overall victory in opening race. 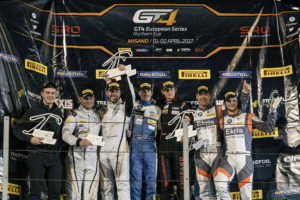 The start of the GT4 European Series in Misano resulted in a very successful and spectacular start to the 2017 season for the “Reiter Young Stars” drivers. Newcomer Jonathan Cecotto (VEN), and partner Lennart Marioneck (GER) delivered a sensational first (night) race that resulted in the overall victory.Jonathan, son of motorsport legend Johnny Cecotto, got off to a flying start with the RYS Team KISKA KTM X-BOW GT4 from the fifth place on the grid. He then slipped back a couple of positions but very soon began to show his strong performance when he went in pursuit of the race leaders. Following a mistake-free, very fast, and perfectly timed pit stop, Jonathan’s partner Lenny Marioneck, delivered a flawless overtaking maneuver to move to the front of the pack.At the end of the race, the Cecotto/Marioneck duo was not only able to celebrate victory in the first race of the season; they also finished with a commanding lead. They were more than nine seconds ahead of the second-placed Aston Martin, and 17 Seconds ahead of the third-placed Porsche. “I lost a few positions in the early stages because the top speed on the long straights was missing on account of the BoP. Then I changed my style of driving and I was able to get back into contention. Lenny then topped that and brought home the win, and we’re very happy,” Jonathan Cecotto commented after the podium celebration. Stephane Kox (NED), the daughter of Peter Kox, also delivered an excellent performance with admirable support from Germany’s Arne Hoffmeister. Together they brought the RYS Team Schönramer KTM X-BOW GT4 home in sixth overall. The third best “Reiter Young Stars” team was the Austrian duo Eike Angermayr and Reinhard Kofler in the RYS Team KTM car. Angermayr delivered a very impressive debut into international motorsport even though this was his first experience of a night race. However, a strong attack by Norwegian Mads Siljehaug, who has taken over from Jamie Vandenbalck in the RYS Team InterNetX KTM X-BOW GT4 remained unrewarded, as was the fact that they delivered equivalent fast lap times to eventual winner Cecotto. In the end it was a damaged tire just a few moments before the finish of the race that put the team back in 17th place. Meanwhile, the second race in Misano could have been a three-way triumph for the Reiter Young Stars, but individual errors resulted in the Cecotto/Marioneck duo in the RYS Team KISKA KTM X-BOW GT4 finishing overall sixth to be the strongest KTM Team. The pair was in second place but then came together with “RYS” colleague Reinhard Kofler, who was looking to continue Eike Angermayer’s impressive run after their pit stop. The KISKA KTM X-BOW GT4 duo dropped back in the pack, and Kofler’s race was prematurely over. At the same time, Jamie Vandenbalck was still on the way to a decisive victory when he went past a somewhat chaotic safety car, and this resulted in a disqualification for him and teammate Mads Siljehaug. The second best RYS Team was once again the Kox/Hoffmeister combination (overall eighth). Emil Westman (FIN)/Samuel Sladecka (SVK) were the third fastest Young Stars at overall 20th after they managed to make a steady improvement on what was a complicated start to the weekend. Successful GT3 Debut for “Reiter Young Stars” season 2016 winners First podium place for Caitlin Wood/Marko Helistekangas in second race.